Captain Jack Sparrow during the Pirate Tutorial at the Magic Kingdom in Walt Disney World. 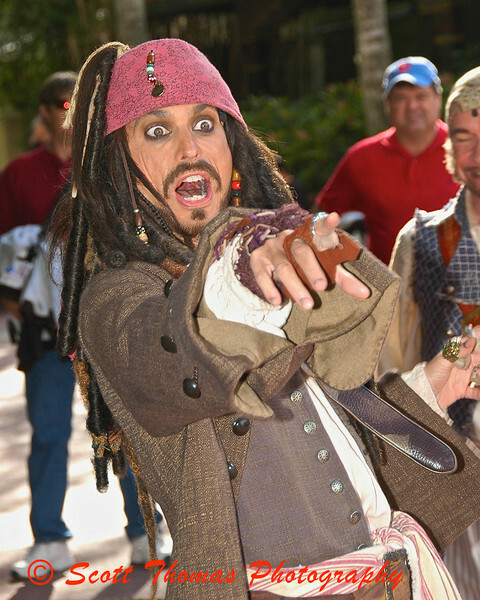 Captain Jack Sparrow attempts to distract his foe by exclaiming, Look! It’s the Governor’s Daughter!, before running off stage at the end of the Magic Kingdom’s popular Jack Sparrow’s Pirates Tutorial outside the Pirates of the Caribbean ride. I used fill flash and manual mode to counter the back lighting by the afternoon sunlight. Though not as apparent in this photo, there is some rim lighting around Jack’s dreadlocks. The flash also helps to separate Jack from the busy background. This entry was posted in Travel, Weekly View and tagged 18-200mm vr, face character, fill flash, florida, jack sparrow, live show, magic kingdom, movie, nikon D70, orlando, Photography, pirates of the caribbean, sb-600, speedlight, walt disney world. Bookmark the permalink. What a fantastic photo! Great use of flash. Using flash is an art in itself. This is a good example of you mastering it. I agree with Michaela. Captain Morgan would do fine these cold days.